A blend of rices native to North America, tend to be nuttier and chewier than other common varieties of rice. Wild rices are chewier than white rice and tend to be nuttier and more flavorful as well. Wild rices are high in protein, lysine, and fiber, as well as thiamin, iron, riboflavin, and B vitamins, making them an extremely nutritious (and gluten free) starch choice. 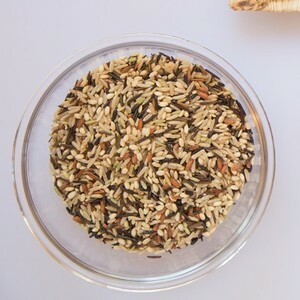 Wild rice is prepared just like white rice, but with slightly different water ratios.